Our spinal structure can lose stability due to trauma, fracture, tumor, deformity, and degenerative disorders. Besides these, spinal cord injuries can happen due to blocked blood supply, injuries, infections, and compression as a result of tumor or a fractured bone. Spinal fusion devices give stability to spinal structure when it loses strength on account of aforementioned factors. The incidence of spinal cord injuries has risen significantly in the last couple years, in boosting the global spinal fusion devices market. With the launch of advanced plating systems that offer improved structural integrity and stability, the market is looking to gain momentum in the coming years. In addition to this, the advent of innovative screw systems and locking mechanisms made from modern materials such as titanium alloy will fuel growth opportunities for the market. To present an in-depth overview, the global spinal fusion devices market is categorized in terms of end user, product, surgery, and geography. For instance, the market encompasses interbody fusion devices, thoraco-lumbar fixation devices, and cervical fixation devices in terms of product. Similarly based on surgery, the global spinal fusion devices market can be bifurcated into minimally-invasive surgery and open surgery. Of these, open surgery held dominance in the market in 2016. However, in the coming years the market is poised to witness a surging demand for minimally-invasive surgeries as they pose lesser risk and complication post surgeries. Among end users, hospitals accounted for the highest share in the global spinal fusion devices market in 2016. Other segments within this category are ambulatory surgical centers, orthopedic centers, and clinics. In the coming years, the demand from clinical and orthopedic centers is forecast to rise thus bolstering growth opportunities for the global spinal fusion devices market. Regionally, the report covers Latin America, Asia Pacific, North America, Europe, and the Middle East and Africa. Among these regions, the market witnessed the highest demand from North America in 2016. 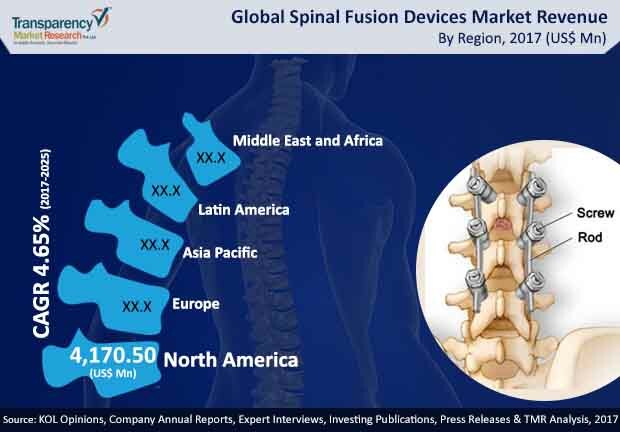 Going forward North America is projected to remain dominant in the global spinal fusion devices market on account of the presence of a sophisticated healthcare infrastructure, high level of awareness about advanced treatments, and the rising focus of market players on innovations. The report also profiles some of the leading companies operating in the spinal fusion devices market. These include K2M Group Holdings Inc., Zimmer Biomet Holdings Inc., NuVasive Inc., Globus Medical Inc., Stryker Corporation, Orthofix International N.V., Exactech Inc., Alphatec Holdings Inc., Braun Melsungen AG, Medtronic plc, and Titan Spine LLC. Spinal fusion can be defined as the orthopedic procedure which involves the fusion of two or more vertebrae to restrict the movement of the affected vertebrae and to reduce the pain suffered by the patient. A range of spinal fusion procedures are performed covering the thoracic, lumbar, and cervical areas of the spine. The research is a combination of primary and secondary research, conducted for understanding and arriving at trends, used to forecast the expected revenue of spinal fusion devices employed in the near future. Primary research formed the bulk of our research efforts with information collected from in-depth interviews and discussions with a number of key industry experts and opinion leaders. Secondary research involved study of company websites, annual reports, press releases, investor presentations, analyst presentation and various international and national databases. The report provides estimated market size in terms of US$ Mn for product type, surgery, end-user, and geography for the period 2015 to 2025, considering the macro and micro environmental factors. The revenue generated from each product type and end-user was calculated by considering the number of spinal fusion procedures performed globally. In addition, the regional trends of these devices, the geriatric population, increasing obesity, and the rise in the number of spine diseases were considered. The market report comprises an elaborated executive summary, which includes market snapshot that provides information about various segments of the market. It also provides information and data analysis of the market with respect to market segments based on product type, surgery, end-user, and geography. The market overview section of the report analyzes market dynamics such as drivers, restraints and opportunities that influences the spinal fusion devices market in the current and future scenario. The report also provides the pipeline products, the CPT codes of reimbursement for the spinal fusion procedures, the regulatory approval process, porter’s five force analysis, and the key industry developments. Market share analysis among the market players is analyzed to signify the contribution of these players in the market in terms of percentage share. All these factors will help the market players to decide about the business strategies and plans to strengthen their positions in the global market. Based on geography, the market has been analyzed for major regions: North America, Europe, Asia Pacific, Latin America, and Middle East & Africa. The study also covers detailed country analysis contributing majorly in the spinal fusion devices market. The report also profiles the major players in the market and provides various attributes such as company overview, financial overview, product portfolio, business strategies, and recent developments. Companies profiled in the spinal fusion devices market report are Major players in the spinal fusion devices market include Stryker Corporation, NuVasive, Inc., Globus Medical Inc., Orthofix International N.V., Zimmer Biomet Holdings, Inc., Medtronic plc, K2M Group Holdings, Inc., Alphatec Holdings, Inc., Exactech, Inc., B. Braun Melsungen AG, Depuy Synthes (a part of Johnson & Johnson), and Titan Spine, LLC, among others.